Vancouver Folk Music Festival 2008 « Vancouver Spotlight – Your Station! Your Stories! Pockets of tents feature a range of food, of local and international cuisine, an artists’ market with hand crafted items, jewelry, and products from co-ops and fair trade organizations. There are eight outdoor stages featuring all styles of music from roots, world music, and hip-hop, to 4000 yr. old Moroccan music, with well-known names such as Spearhead and Bill Bourne attending. Performers are teenagers through to elderly folks, and all are part of this unique tradition of diversity, and for the enjoyment of a common thing- the music. Walking around the crowd of festival goers one sees spoken word artists, people having garage sales, fields of parked bicycles, and giant birds on stilts amusing the kiddies. The vibe is one of a community-orientated event at the beach, with people from all walks of life simply jamming. Visit www.thefestival.bc.ca for information on next year’s event. 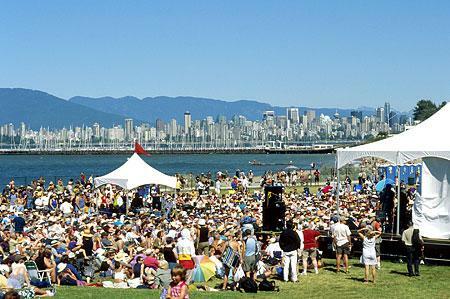 This entry was written by vanspotlight and posted on September 5, 2008 at 8:33 pm and filed under Music, Outdoor Activities with tags community, festival, folk music, Jericho beach, market, outdoor, vancouver folk music festival. Bookmark the permalink. Follow any comments here with the RSS feed for this post. Post a comment or leave a trackback: Trackback URL.